This column was written by Mark D. Tooley. The most poignant moment of the May 31 dedication of the Billy Graham Library was the tribute to the 88-year-old evangelist by 82-year-old former President George H.W. Bush. 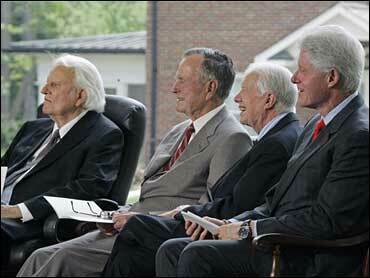 Three former presidents were present at the dedication in Charlotte, N.C. Jimmy Carter praised Graham's early opposition to racial segregation. Bill Clinton recalled, with suspect sincerity, that the "best date he ever had" was taking his soon-to-be-wife Hillary to a Graham crusade 35 years ago. But an emotional George H. W. Bush was unique in describing Graham's influence as both spiritual and geopolitical. "The moral awakening that Billy helped to ignite starting here in America — which then spread like a wildfire across the country, and ultimately around the world — was also the same spark that ignited hope and kept its embers burning in far away places, behind an Iron Curtain," Bush recalled. "And just as there was a coalition of free nations that stood together in the face of this geopolitical threat, so, too, was there a brotherhood of great spiritual leaders — including our honoree and Pope John Paul II — whose unaffected charisma and purity of purpose played a decisive role in resolving the moral crises of our times." Bush concluded: "No question, these men, together with other messengers who carried forth The Word, helped tip the balance in the Cold War in freedom's favor." Graham has been America's chief religious celebrity for almost 60 years, a spiritual statesman who has been acquainted with every president since Harry Truman. Bush justifiably called him "America's pastor." So it is easy to forget where American evangelicals were when Graham's ministry began in the late 1940s. The liberal mainline Protestant denominations firmly controlled America's religious public square when Graham first appeared on the stage. Evangelicals were commonly derided as fundamentalists, a group long since discredited by academia and the respectable denominations. The nascent evangelical subculture was just beginning to challenge the hegemony of liberal theology in America's Protestant churches. Graham's early evangelistic crusades were famously "puffed" by the Hearst press, at the direction of William Randolph Hearst himself. But Graham's quick fame relied more on his own charisma and organizational skills than Hearst's puffing. Graham's style was revivalistic, but not chauvinistic. It recalled the better moments of America's 19th century revivalist history, while appealing to country's burgeoning new suburban demographic. From the start, Graham was interested not just in crusading soul-saving, but in the intellectual reformation of American religious thought. He helped found Christianity Today magazine to articulate mainstream evangelical thought and challenge liberal Protestant journals such as Christian Century. Symbolic of a larger transformation in America's religious demographic, Christianity Today now has nearly four times as many subscribers as the liberal flagship Christian Century. Although liberal Protestantism stood atop American religion in Graham's early years, it was ripe for a fall. Its denominations began their long decline in the 1960s, soon followed by falling enrollment at its seminaries. America's ten largest Protestant seminaries are now all evangelical, whereas 50 years ago they were all liberal Protestant. America's mainline churches followed the direction of European Christianity both in their theological liberalism and their demographic implosion. Without Graham's evangelical revival, America's religious culture could well have followed Europe's spiritual route. Graham re-injected evangelical Protestantism back into the front portals of American culture, building a firewall against aggressive, European-style secularism. Importantly, he modernized evangelical culture, purging its previous hostilities towards Catholics, its accommodations towards segregation, and its suspicions of higher education. Graham's friendships with nearly all the last 11 presidents and his prominent role in state worship events symbolize evangelical culture's ascendancy in America. Graham, the Southern Baptist preacher, stands where Episcopal bishops, now nearly inconsequential, once stood in national prominence. Indeed, President George H. W. Bush was far more influenced by Graham than any cleric of his own denomination. "As an Episcopalian . . . I have always viewed my faith as an intensely personal matter," Bush said at the library dedication. "There is nothing self-conscious, however, about my relationship with Jesus Christ; and thanks to Billy, I have come to understand this all-important relationship in deeper and more meaningful ways." Bush recalled that Graham had stayed at the White House while Desert Storm was launched and had guided his children, including the current president, through their own spiritual journeys: "The family love we Bushes feel towards you and Ruth extends all the way into the Oval Office." His own life roughly paralleling Graham's years, Bush remembered that "at the time of Billy's rise . . . the clouds of fascism had gathered in Europe . . . and the storm they unleashed would threaten the existence of free and open societies. And after a great coalition of free peoples poured forth the blood of their sons to defeat this machinery of death, we faced another threat — a rising tide of tyranny in the Soviet Union." In both World War II and the Cold War, Bush said, "Freedom's victory was far from foreordained. It would require vigilance in the face of laxity; courage in the face of appeasement; moral clarity in the face of relativism; and above all else, hope in the face of despair." These matters of state were never separate from the spiritual issues to which Graham had dedicated himself, Bush observed. Graham's central role in restoring America's religious spirit contributed directly to democracy's survival internationally.